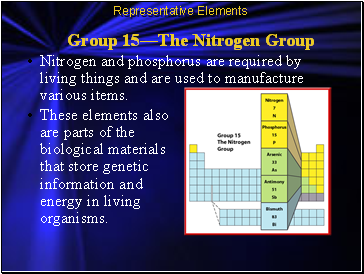 Nitrogen and phosphorus are required by living things and are used to manufacture various items. These elements also are parts of the biological materials that store genetic information and energy in living organisms. Although almost 80 percent of the air you breathe is nitrogen, you can’t get the nitrogen your body needs by breathing nitrogen gas. 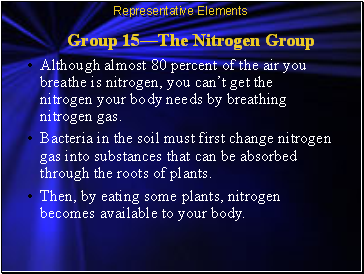 Bacteria in the soil must first change nitrogen gas into substances that can be absorbed through the roots of plants. Then, by eating some plants, nitrogen becomes available to your body. 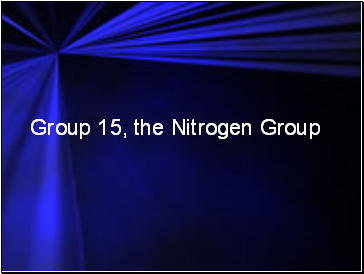 Ammonia is a gas that contains nitrogen and hydrogen. When ammonia is dissolved in water, it can be used as a cleaner and disinfectant. 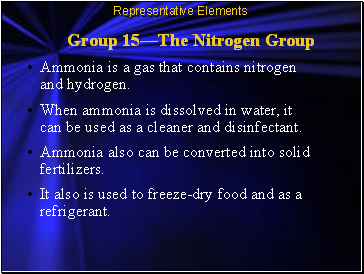 Ammonia also can be converted into solid fertilizers. It also is used to freeze-dry food and as a refrigerant. 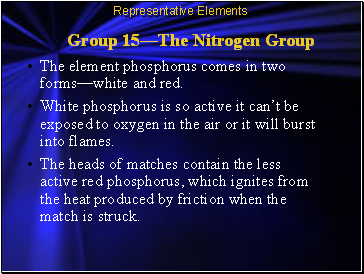 The element phosphorus comes in two forms—white and red. White phosphorus is so active it can’t be exposed to oxygen in the air or it will burst into flames. The heads of matches contain the less active red phosphorus, which ignites from the heat produced by friction when the match is struck. Phosphorous compounds are essential ingredients for healthy teeth and bones. 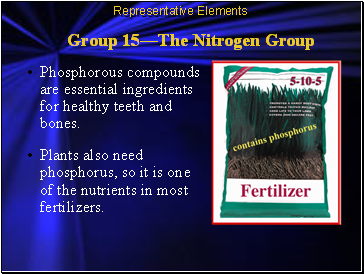 Plants also need phosphorus, so it is one of the nutrients in most fertilizers.